This item combines two pieces authored by Nikola Tesla in 1904. 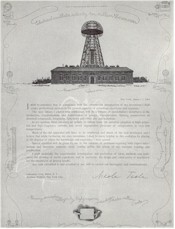 The front and back covers are reproductions of an illustrated brochure issued by Tesla in which he proposes to enter the field of consulting engineership. The enclosed article THE TRANSMISSION OF ELECTRIC ENERGY WITHOUT WIRES, appeared in the March Electrical World and Engineer, and provides a summary of his work and achievements in the new wireless technology.